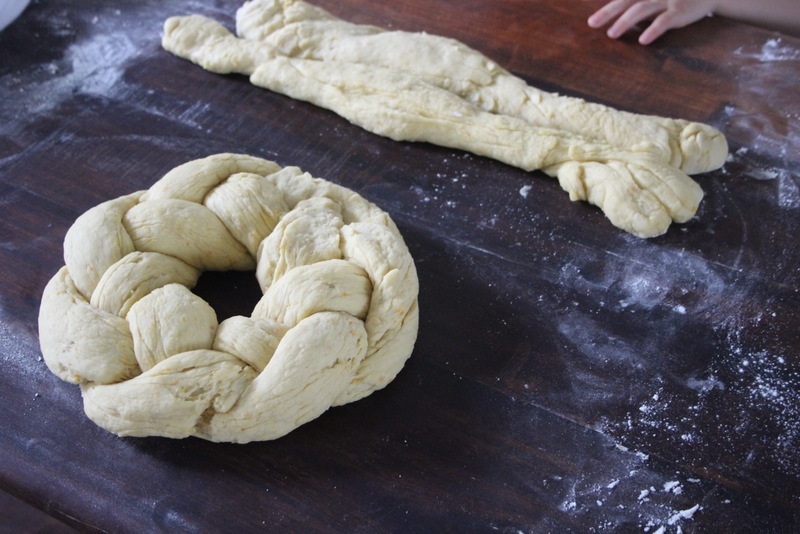 This Braided Easter Bread, known in Italian as Pane Di Pasqua, has become a family tradition. Although we have no Italian ethnicity in my family what so ever, adopting traditions is a great thing, right? Growing up, we always proudly placed this bread on our Easter Sunday breakfast table as a colourful and tasty centrepiece that we would quickly devour. Typically this recipe is flavoured with orange or lemon, and anise and often decorated with icing, sprinkles, or with dyed eggs. It is an eggy, fluffy, slightly sweet, rich and soft, brioche like bread that is yummy with butter! 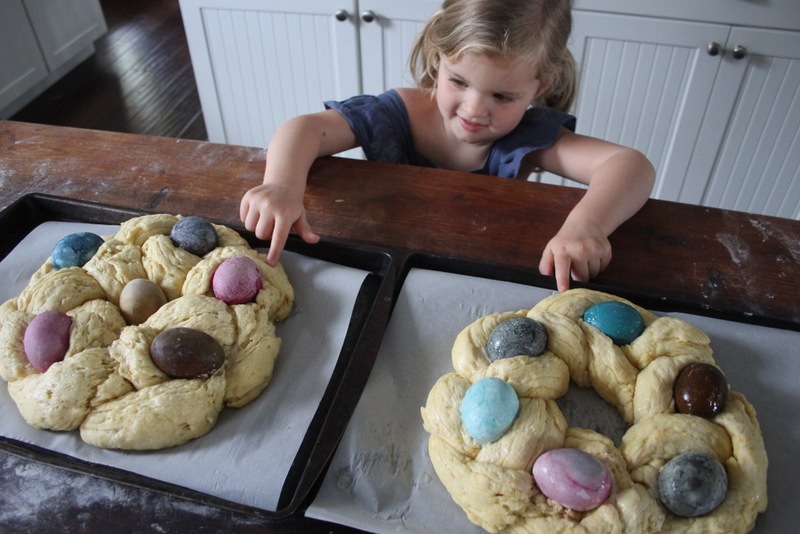 This year, I decided to make braided Easter bread to start the tradition with my own daughter. And since I hadn’t made this recipe for years, it was a bit of an experiment. We decided to avoid icing and sprinkles so we could have it for breakfast, (although it does look pretty). And we decided to dye eggs, *(not an essential step but a fun one), for our bread, but we chose to do yet another experiment (why not!) 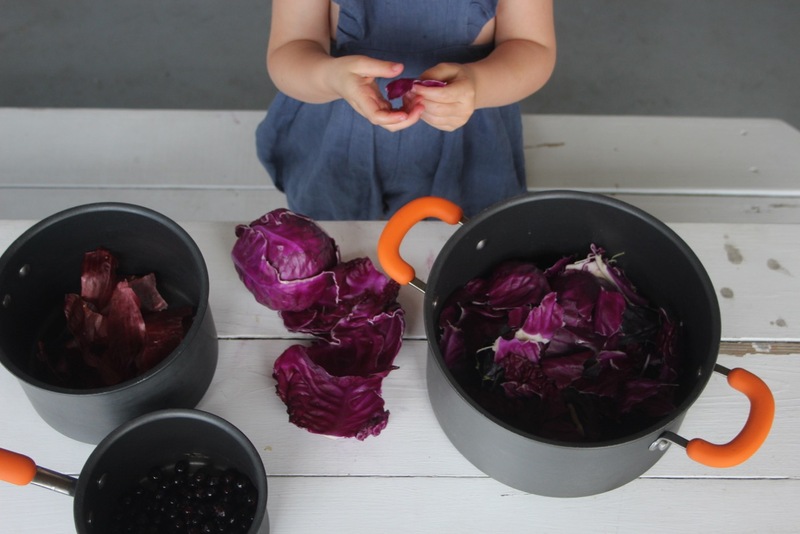 and I quickly researched how to make natural dyes — using foods like red cabbage, onion skins, blueberries, coffee, beetroot. It was so fun. In the future I would also try brighter yellow and orange colours with spices like tumeric and perhaps some flower petals as well. 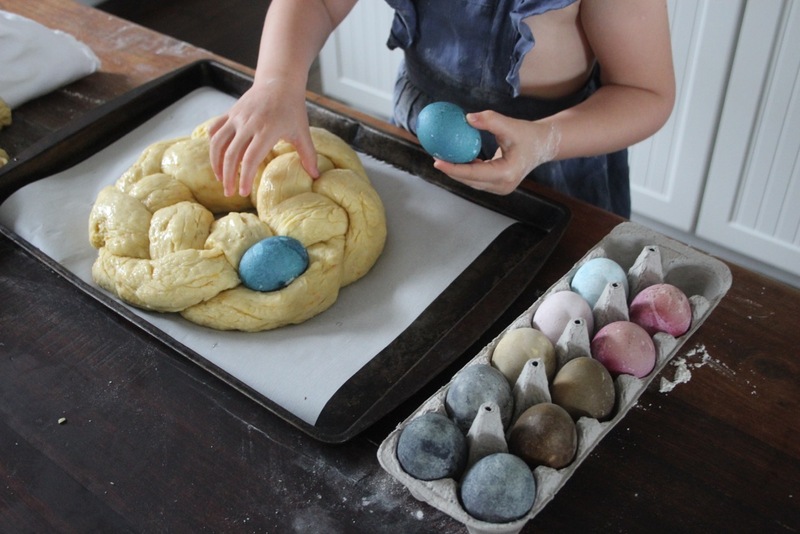 It was also a good thing we dyed eggs the day before the bread baking because both projects have a few stages. But we loved the dyeing and the fabulous surprise colours we got (the science of it is fascinating!). And knowing the dyes were all organic and natural food based just makes sense on food we will be eating! 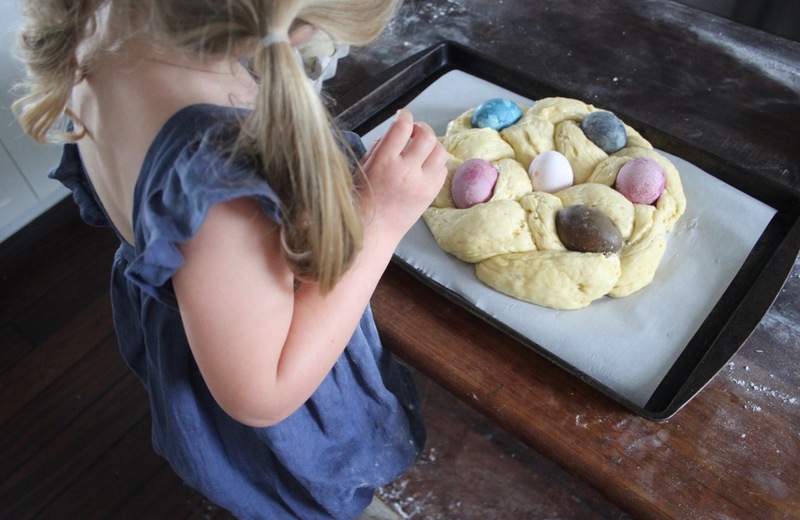 It is a slightly involved recipe, with resting (and proving time) but use that time to dye more eggs, make Easter crafts, play with the dough, learn to braid dough, and most of all to chit chat. 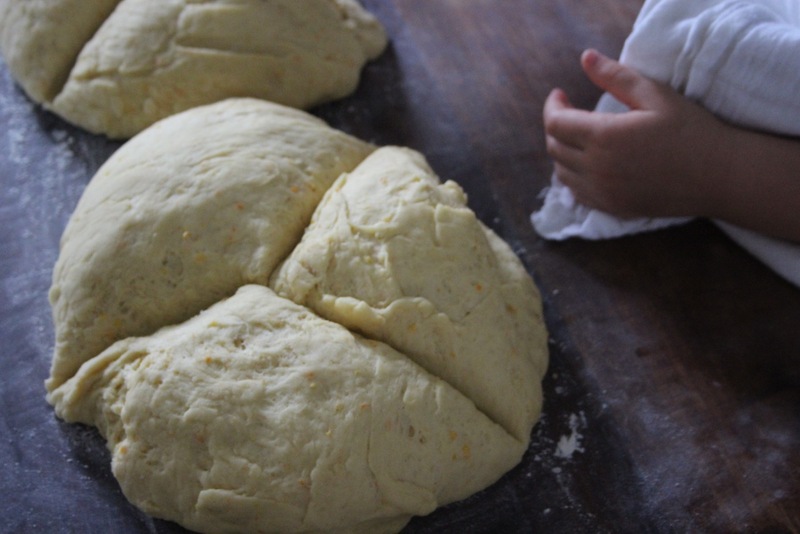 Good luck, and please look up Pane di Pasqua if you would like to see how other cooks interpret this recipe. This recipe makes 2 loaves, takes 3 hours of prep time, and 1 hour of cooking time, egg dyeing not included. Multi coloured sprinkles…or… Raw eggs that are dyed. (We used 5-6 per bread). Note that the eggs cook in the oven when the bread goes in! 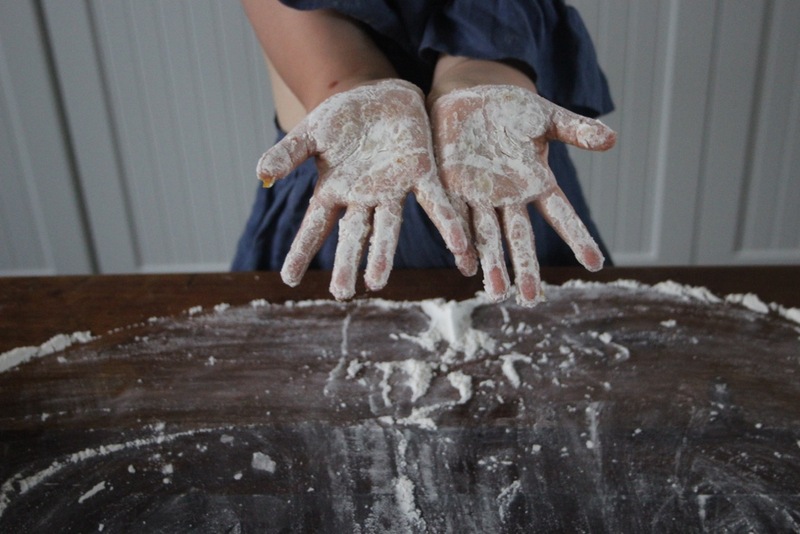 Place the flour in a large mixing bowl, set aside. 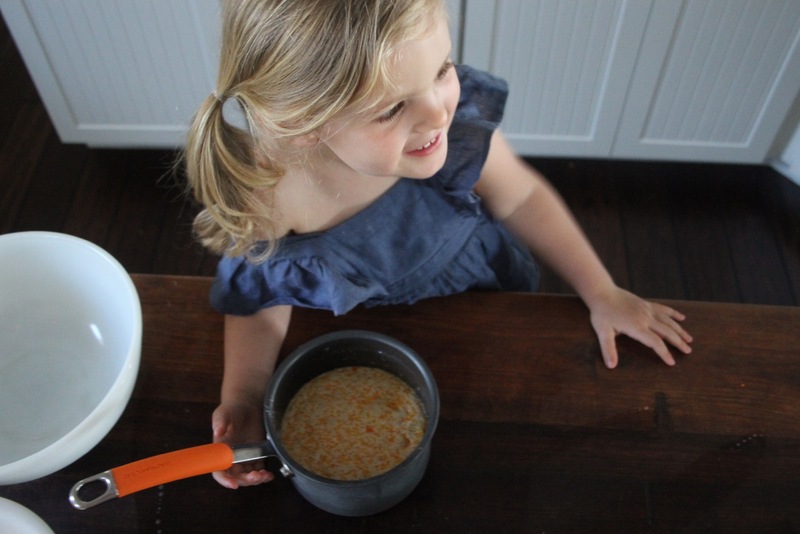 Heat the milk in a small saucepan over low heat, stirring occasionally, until it is warm to the touch, but not hot. If you have an instant-read thermometer,the temperature of the milk should be between 110 and 115 degrees F.
Next, add the melted butter and continue to mix. 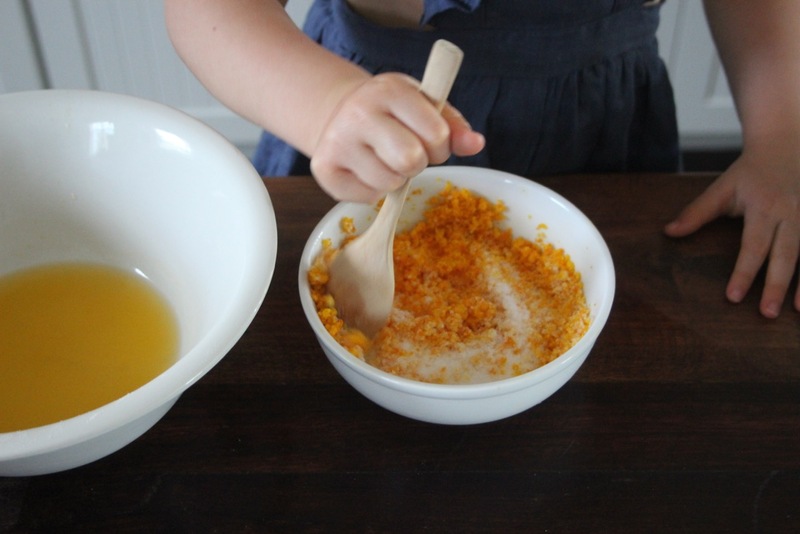 Then, add the orange juice to the dough and mix to combine. In a small bowl, use a fork to lightly beat together the eggs and salt. Add to the dough and continue mixing. 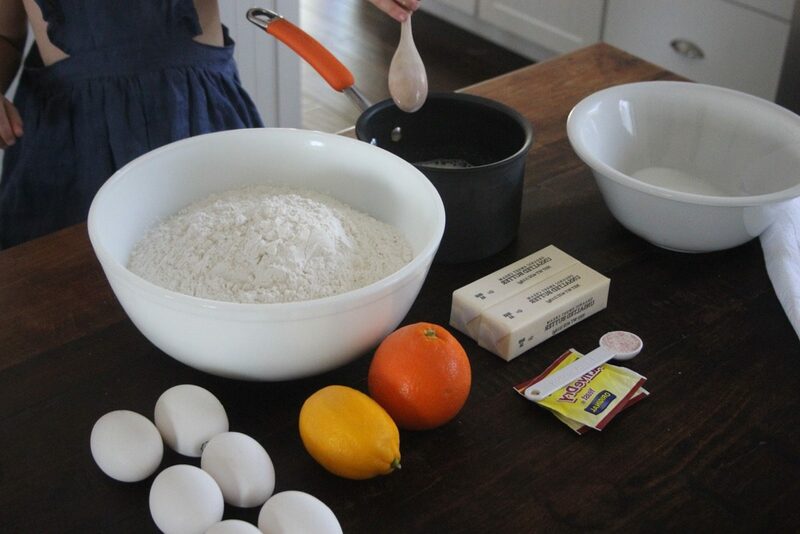 At this point, you may need to add more flour to the dough, depending on how much juice you get out of your oranges. (I added quite a bit more to get the dough to come together.) 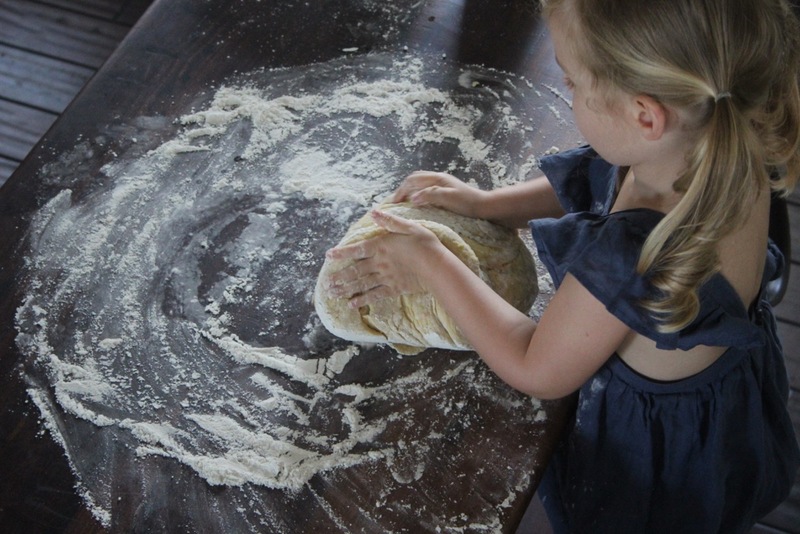 Once you have a sticky ball of dough formed, turn it out onto a floured surface and knead for about 5 – 10 minutes, adding a small amount of flour at a time as needed, or until the dough is soft and elastic. It will remain slightly tacky. 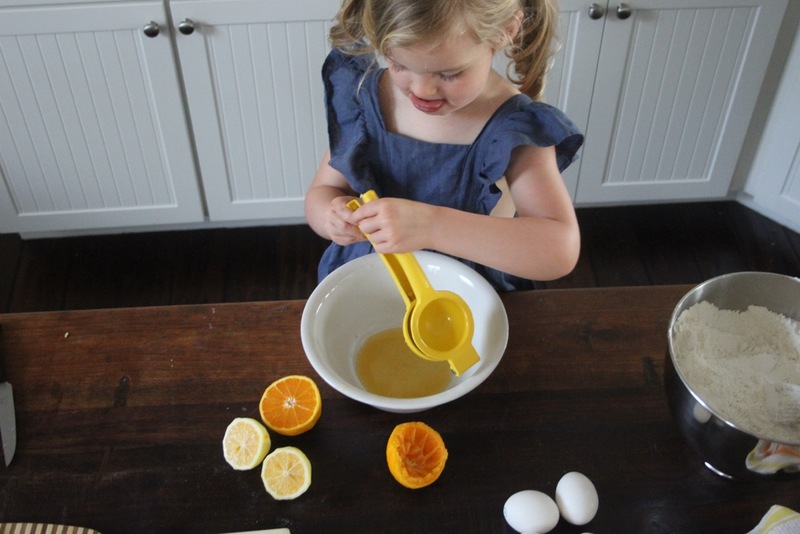 This is so much fun for little helpers! Place the dough in an oiled bowl, turning to coat, and cover the bowl loosely with plastic wrap to prove. Place in a draft-free area and allow to rise until doubled in volume, about 1 hour. Meanwhile, line two baking sheets with parchment paper and set aside. 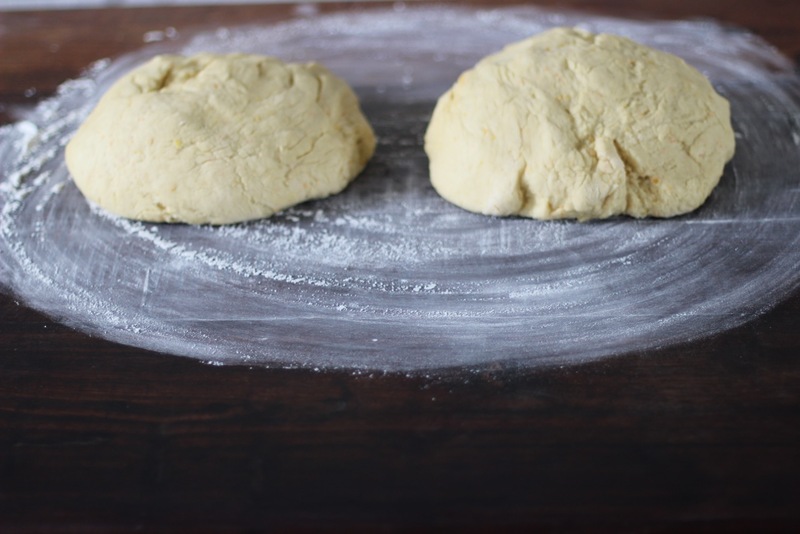 Turn the dough out onto a clean surface and divide into half. Then divide those two balls into thirds so you have six similar size balls. 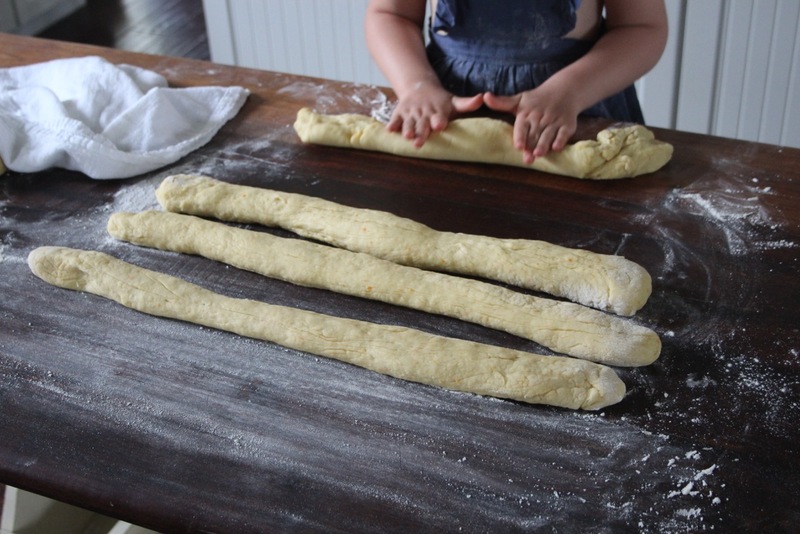 Roll the dough into 24-inch long ropes. Loosely braid the ropes together. 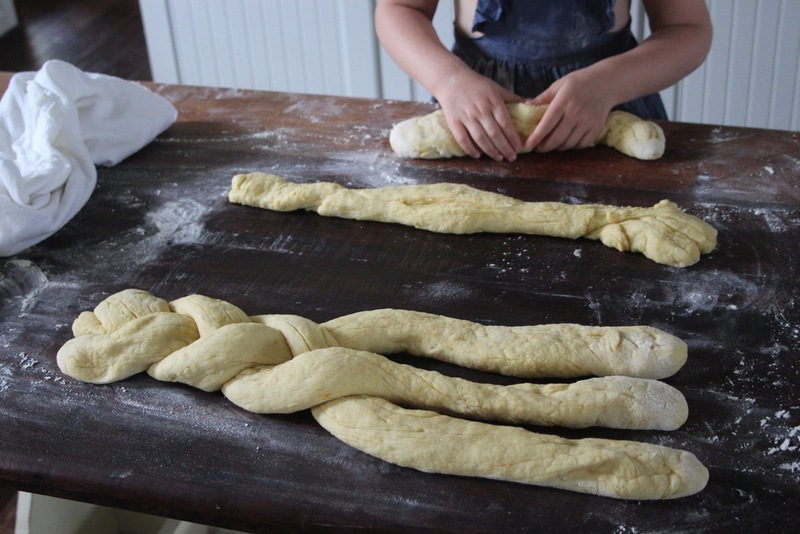 Transfer the braided rope to one of the prepared baking sheets and bring the ends together to form a ring, twisting and pinching the ends together to seal. 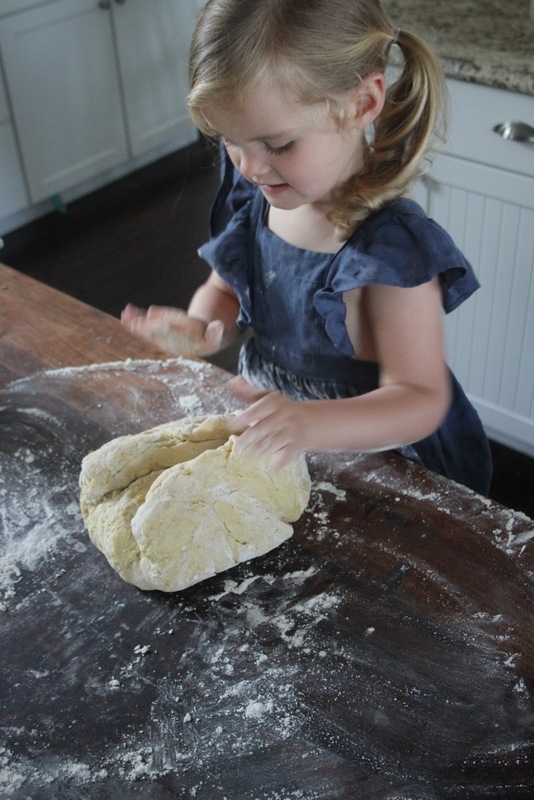 Repeat with the remaining pieces of dough so that you have two circular, braided loaves. Brush the tops of each with the melted butter, (or egg yolk, which I forgot my mother always used and creates a shiny and polished look!) 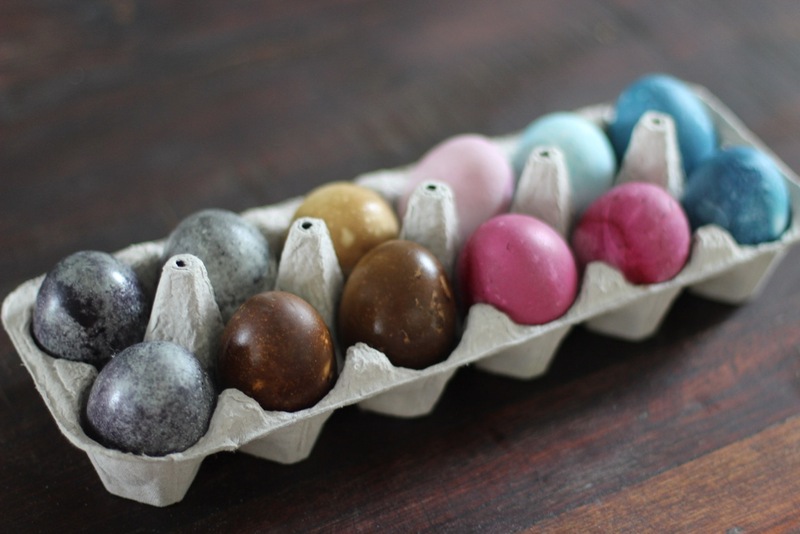 then tuck the dyed eggs into the braids, if you are using those. Cover the bread loosely with plastic wrap, and let rise until nearly doubled in size, about 45 minutes to 1 hour. While the dough is rising, preheat the oven to 350 degrees F. Bake one at a time until golden brown on top, 30 to 40 minutes. Remove from the oven and transfer to a cooling rack to cool completely. 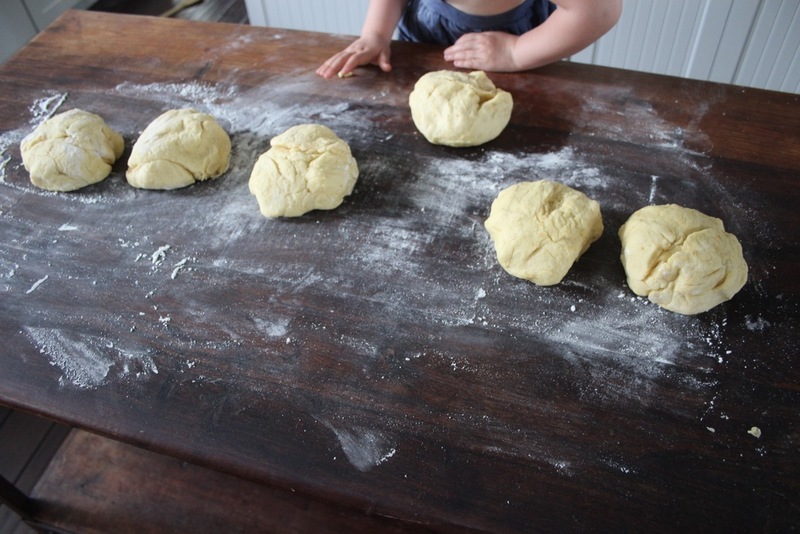 Notes: *While I mix this by hand, you could certainly use a stand mixer fitted with a dough hook instead. My dough has been “rising” for about 2 hours… but it doesn’t seem to have grown much. Could I just let it rise overnight? Did you use dry yeast or fresh yeast. Perhaps it needs a bit more time. Hope your dough has risen now! Enjoy that yummy bread. This was super yummy! Are you able to freeze this bread? If so, how long does it store? But I am sure you can freeze it, just without the eggs. Good luck.